Join us live each week at www.productivity.academy/live and get your questions answered by submitting them at anytime right here: www.productivity.academy/questions. You can watch the video for the past episode recorded on April 4th, 2019, above, or you can review the transcript below. How to process email efficiently with automation? Alright, we are live. Welcome everybody to Episode 77 of the live Q&A for Productivity Academy. If you’re joining us live, go ahead and you can pop any questions in, whether you’re in the group you’re watching on the page, just go ahead and pop that in. And I’ll come back to that as we go along here. I’m going to minimize my screen and get this up while we go. Let’s see, switch over and make sure that that’s working. Alright, we are looking good occasionally have some fun tech issues setting this up. So let’s start today. What we’re going to talk about today is an update with IFTTT and how we can build an automation to fix something that I consider to be very important. There’s sort of great automation so you can set up so you don’t spend a ton of time in your email inbox. And what some changes that Gmail made to the way that some of these services access you can no longer do that using IFTTT. So I’m going to go through and show how you can do that. Using Zapier, so free to set up and that’s going to be awesome. And then as time allows, if we have some extra questions, we will get in to those. So real quick, if you haven’t joined the community, come join the Facebook group. If you’re checking out the replay, you can find the link below. If you want to as long you’re checking out the replay on YouTube, you can subscribe stay up to date with of course, these videos. You can ask questions anything about productivity, time management, automation, team building, all that sort of good stuff, as well as occasionally there’s new stuff like this comes out where there’s updates to automation, reviews on new products and services, all that sort of good stuff. So let’s get into it. I’m going to switch over here to the second monitor. And there we go. So yeah, you can see this right here said an important notice about Gmail service. So unfortunately, Google change the way they implemented some of the their API. And now you can no longer do what we used to be able to do, which is really neat. You could go into your email and star an email, let me show you what I mean here. Go into the productivity academies, Gmail, you could just start an email and then do something based off of that. So for example, I could start an email and have it pop into my to do it so that you know, the few times I try to go into email each day, I don’t get sucked into this rabbit hole having to deal with everything, I can quickly say, hey, let’s deal with what’s really important right here. And you know, something I can take action on right now. And then maybe there’s stuff that’s also important, but it’s not something I can do quickly or it doesn’t need to be action right now I can start it and get that put into to do us where I can then sort it later and then get out of my inbox. So I’m not in here and ending up in some crazy email, rabbit hole, you know, for five or 10 minutes at a time. So unfortunately, that’s not working. But that’s okay, because using Zapier, we can set up something that it’s, you know, just as good if not a little bit better. I think that the formats and some of the options you get really makes this worthwhile to set up. So let’s get started on this if you don’t have this yet, and you just want to follow along and set this up for yourself. I think this is a great one. So let’s just get started. First of all, you can go to Zapier, it’s free account easy to set up. And this is just kind of what it looks like with a mostly blank account here I’ve got a test account I have for setting this up. And we can go in and we’re just going to click on make a zap. Okay, I’ve already gone through and done some of these steps. If it’s your first time doing this, you’ll need to connect apps as you go but it’s super simple so long as you’re logged into them. You can go ahead and just authorize it will have a little pop up saying hey, you know do you want Gmail to have access or rather do you want Zapier to have access to Gmail or to do us you to click yes, and it’s good to go. So, like we said, we want to have something happen when we start an email, and that’s called the trigger in Zapier. So you just think of it as an action when I do something, what is that, and in this case, it’s starting an email. So we’re going to select that one, there’s a lot of other things you can do. But for that, we just need to click that Save and Continue. And then if you have more than one account, you can select it, or you just click in this case, I just have the one Save and Continue. And then does it don’t little pulls in options so you can see some of the test data. So I got a email I sent myself Don’t forget about this email, and then any other information you have down here. So let’s continue. And now it’s just telling us yours app currently lacks an action Step Add one now and that just means Okay, well, we’ve got a trigger. So Zapier is going to say hey, something will start now. What am I supposed to do with that? So you click down here and click on Add a step, there’s a lot more we can do, we can filter things out, we could pause or delay for amount of time. We could do some formatting. We could take something from the email and formatted differently. But in this case, we’re just going to stick with simple two step setup here. And in this case, we’re going to use to do list. Okay, a quick word on this, you could set up, you know, anything else that Zapier is connected to, and it is connected to thousands of apps. So just because you’re not using to do us, doesn’t mean you can’t do this. We use Evernote, you could connect it to Evernote. If you’re using one of you know, many other than good to do apps connect those it’s basically the same, it just may have little bit different data entry, which I’ll show you as we set this up, but the idea is the same. Okay, so once we’ve started this email, what do we want to do? Well, we want to in general, create a task right? That’s what we’re going to do for this one because we want to have it pop up in our inbox so that we can deal with it the next time, you know whether it’s beginning or end of the day when we go through and clear out our tasks. Alright, so let’s continue on. Okay, again, I’ve already connected this, if you hadn’t connected your account yet, you just need to authorize it, there would just be one additional step there. So let’s continue. And this is where the fun comes in. So if you’ve used to do list, some of this should be pretty clear. If you haven’t, that’s okay. A lot of this is similar and different programs, you just need to select where you want this to go as a task. And it says by default is inbox. I prefer to just go ahead and select it. And I do that because I want it to make sure that it’s in my inbox and I see it. Title, this is going to be I’m going to hop actually ended to do it. So we’re just going to make one real quick. This is a test. Okay, so this is what’s called the title and then over here, we would have notes if you have the premium version, but titles enough to get this done. So let’s go over here. And this is where the fun comes in, because now we can start pulling things out from the email. So let me pull that up real quick. Alright, so now we just think about what is it, we want to tell ourselves, right? Because we get to kind of design this. And this is the fun part. So I like to be very literal when I do this, so that when I go through my tasks, I know exactly what it is. So I’m going to write start email, I need to review it and set an action. All right, and then the next line. And this is a little introduction to some formatting, you can use two stars and that will bold things. So this helps set it out. I like to know who it’s from. And now we can go in and we click this little button or area over here. And we’re going to search for from name that’s who it’s from, but I want to know the email. And again, you could use name or email, however you want to set it up, but I just recognize the email real quick when I go through that. So I like having that. Plus, if I need to do something or send something back, I have that really handy. Okay, something else you might want to do if you have multiple email accounts is a to field. So who was this sent to was this to a particular email address you have. And in this case, we will do two emails. And if you only have the one email account, you could probably leave this off, that’s fine too. And then I like to have the subject What is this about? And I want that to be bold as well. So let’s do subject and choose that from the drop down. All right. And then the last thing I like to do since I use a browser, and I like to keep my email closed, so that I’m not tempted to go in there, right. I’m a creature of habit. If I see the tab with the Gmail or I see a notification I’m probably going to get distracted. So this is a fun one. I like to add, you can do a link to the email itself. And then add that in there. Let’s go find that. There we go message URL, that is the link to the exact email. So if you click on that, it will open it up in your browser good into Gmail, and it’ll bring up that email. So I find that really handy too. So it doesn’t just take me to my inbox where I might get distracted, I get to see just that email. So super helpful. Now, the one extra thing that I think you could do if you’re using the premium version, is you could attach the email as a note. And again, we saw that over here where let me bring this back up, cancel. If we tried to do that it says, you know, comments and file uploads or premium features. You don’t need that because we’ve already added the link in here. But if you wanted to go one step further, you could use that field to add the entire email so you don’t even have to go out it to do us sometimes and if you wanted to do that all you would do down here is as a note, you would add, let’s bring it up right here. Ah, well we could use the raw snippet is the one I believe I’ve used before. So I’ll just put that in there so that that gets added in. Again though, if you’re just using the free account, you can just leave this blank and that is totally fine. Now let’s go through the rest of these. If you are using this with multiple people, you could assign it to a person. For myself. I just used to do this to myself. It’s kind of my personal starting point and quick ad for tests so I don’t worry about that. The due date and this can be human formatted. This is nice suit that means you can say things like today tomorrow. For me, I highly suggest and I use this I just say today. And that way it goes immediately into my inbox and it shows up immediately. So I see it. If I’m doing for example, stuff during the day I go in, I have an email i star, then I will see that maybe when I’m doing my end of day shut down, or if it’s in the evening, and I don’t or don’t or can’t be want to deal with it, then I can start it and get to that the next day and I make sure it just shows up right away. Okay, due date, if you want to do something more fancy you can get into that, but I find human formatted and saying today works just fine. And then priority. This is where you can set it wherever you want. And all this does is it changes how things are prioritized in to do list. So let’s call this is an elevated task. And then that’s what this is over here the priority which you can type in or you can set the flag by clicking so let’s go p two would be elevated will change it. So you have p for p three, p two p one. So this would be an example of P for it’s not elevated, and you have p3 p two p one. So that’s up to you. And once you, you can see what happens when I put that in here, it goes above the normal priority. And if we do another one, and let’s set it at an even higher one will go priority one, then that goes at the very top because it’s a higher priority. So that’s up to you. It To me, it makes sense to give it elevated, I just do the p3. And I find that that is helpful. So once you’ve got that through, you basically got this all set up, and we can go and now the fun part is testing it and make sure we like what it looks like and that it’s working correctly. We want to make sure that you know it looks the way we want and the right things are in the right place. So let’s send the test to to do it. Alright, so is it was successful. So let’s go over and see what’s there. Alright, so right there, and now we’re seeing it. And we’re seeing that there’s some issues with the formatting, because it’s showing the stars where it should be bold. So what we can do now is go back and remove that. Otherwise, this is looking, okay, we see that it’s got all the right field, it says from and two, it’s got the subject line, and then we’ve got the link to the actual email. So let’s see how that works. and go back in and for us, since I’m recording this, I’m not sure why it’s doing that and I don’t want to sit here and futz around with it. So I’m just going to remove it. And we will take those out. And then you can look into the formatting guide. The To Do List provides. So let’s continue. I’m going to go ahead and delete this one. Okay, and we can retest it. So let’s send that test to do just thinking about it. And let’s see if it’s gonna go. There we go. Alright, so that looks a little bit better. We could add some spaces in here, cleans up, do what we want, but that’s good enough for now. I’ve got everything on one line. Rather, we’ve got it formatted the way we want it. And I guess by opening it up, I kind of screwed up the formatting, which is the way it goes. But that’s the way this goes. You kind of iterate a couple times you get it the way you want. If you don’t like something, you come back, do it quickly. You just keep testing once it’s the way you want. It will just pretend we’ve got it the way we want it. Click on Finish. Give it a name. I find that this helps to be very literal and descriptive, especially if you have more than one of accounts, like a several emails, you might say which one it is. So I’m just going to say, pa from productivity Academy, Gmail star to do list so that when I looked through if I had a bunch of these zapped that I would be able to quickly see what’s going on, and then I just turned it on. Alright, and that’s it. So it’s turned on. And now anytime I do this, let’s for an example go in here and we’re going to wait for it to load and I’m going to start that email. Now Zapier can take a few minutes to run generally this one runs right away, but we’ll, we’ll give it a minute and see how it’s going to work. But while that’s happening, don’t want to have everyone sitting there just staring at a screen and know how fun that can be. But this is just an example of something that can save you so much time. And it seems so, so simple on the surface. And, you know, setting this up took, I don’t know, maybe 10 minutes. But I find that I go into my Gmail inbox probably four times a day on the good days, you know, sometimes I’m able to get in there and get out. But I have time set aside where I go in. And, you know, I see, okay, I’ve got these emails, I need to deal with them, I can either delete the ones I don’t need, I could set up a filter, if I’m seeing recurring emails that I want to keep, but I don’t, you know, need to have in my inbox. And then, you know, there’s things that I need to take a quick action on. And then there’s others like, Oh, this isn’t truly important, but it’s, you know, an upcoming thing, or I need to sit down and do some thinking or, you know, it’s more involved. And by being able to just quickly start and then sort the rest of them and then get out of that inbox, I would say saves me, you know, at least a couple of minutes every time I do that, and you know, we think about that, like oh, it’s just a couple of minutes, but then four times a day, five days a week, 50 plus weeks a year, it adds up. And I did a I calculated it out one time, and it was something like 25 hours a year. If you just check your email like three times and it wastes, you know, like two minutes of time. It’s crazy. So yeah, you can get back a day of your life setting up that automation. So I think that that’s a pretty cool way to do it. And it’s really nice to it helps me be more dependable when I see those emails, and no longer worried that, you know, am I going to have to come back or, you know, did I copy and write my, you know, paste into to do list and do something wrong? Or did I forget to write myself a note, no longer have to worry about that stuff. So I’m going to check back on the page and see if we’ve got any questions. All right. Don’t see anything just yet. All right, I think that’s going to do it. So I highly suggest that you set up this automation it’s a really cool way to save yourself a ton of time and to definitely make yourself more dependable I love it. I’ve got it set up for multiple accounts and just make things run much much more smooth smoothly. So if you’re checking out the replay Thanks for watching, you can subscribe or come join us in the rural of productivity group below. With the weekly Q&A you can always, regardless of where you’re at, ask questions ahead of time at productivity dot Academy slash questions. Also want to say to I’m going to put this into the comments below. 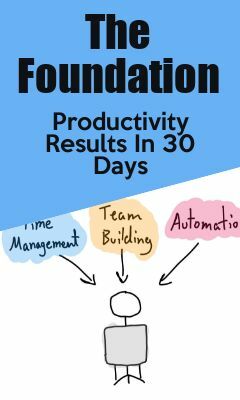 But if you’re interested in learning more about exactly like this automation if you want to get a really solid productivity Foundation, be running a 14 day challenge that you can get on in on and I’ll put the link below if you’d like to be on the early access list and going to run through that it’s going to start on the 24 adult on my calendar in front of me 24 to 25 of April and run for the two weeks after that. So if you’d like to get it in on that, grab the link and get signed up today. Other than that I am done for today. I don’t see any more questions. So I will see everyone next week. This article was posted in Questions and Answers.